The Louvre, the British Museum and the Metropolitan Museum of Art are among the biggest museums in the world. If you try to visit one of these giants in an afternoon, you will quickly get hungry, tired and before long, miserable. (Seriously, people give themselves a week to explore Disney World.) Breaking Down is a series of articles designed to help you navigate the world's biggest museums with mini-visits. Let's talk about the Metropolitan Museum of Art. The Met defines our very idea of an art museum. The entire span of eastern and western art is held under one roof while two branch museums, the Cloisters Museum & Gardens and the forthcoming Met Breur, offer more focused visits. 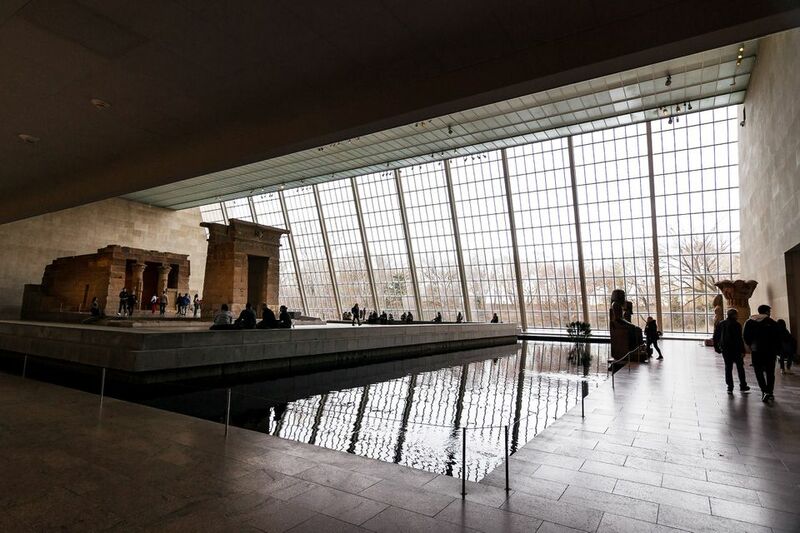 Partially inside Central Park with its grand entrance on Fifth Avenue, a visit to the Met is also a quintessential New York experience. So how can one best experience the Met with only a short amount of time to do so? The Met is open seven days a week from 10am-5:30 pm, but on Friday and Saturday night it's open until 9 pm. Right around 6 pm, the crowds start to thin and a small orchestra begins to play classical music on the balcony. This is the perfect time to wander through the Met without any particular agenda. Some of the galleries close on late-nights due to staffing, but the Met is so stuffed with treasures that a wandering first-time visitor might not even notice. Pay a visit to Madame X in the American Wing and see if you notice the place just below the shoulder where her dress strap once fell before it was deemed too scandalous and the artist, John Singer Sargent, was asked to change it. During the day, you'll rarely get to see Madame X without a crowd of admirers, but at night, she's all yours. Duck underneath the main staircase where you'll discover an exhibition of Egyptian jewelry, ivory, and glass from the Byzantine era. Ask a gallery guard to point you toward the Chinese Court Yard in the Asian Art galleries. Once you do, you'll feel as though you stepped out of the museum and into the Ming Dynasty. The Met is an encyclopedic museum. Each section has its own department of curators and experts which means whatever section you choose is like visiting a museum within a museum. Have you been fascinated with ancient Rome ever since you saw Gladiator? Finally, want to see those Monet Water Lillies in real life? Enter the museum through the main entrance, grab the map from the information desk right in the center, and pick the section that most interests you. A couple of focused hours with the mummies will ultimately be more rewarding than trying to take in a bunch of galleries that might not really interest you. Enjoy yourself and don't turn the experience into the cultural equivalent of eating your broccoli. My friends are often surprised when I get tired in the Met before they do. "Isn't this like your favorite place?" they'll ask. Sure, but I get hungry, tired and start to feel that nagging sense to check my Twitter just like everyone else. Fortunately, the Met has plenty of places to stop and refresh yourself. If you're hungry for a serious lunch, visit the cafeteria. It's often crowded but offers the best value when you really just need to eat. For a light lunch, afternoon tea or glass of wine, visit the lovely Petrie Court Cafe overlooking Central Park. If you visit during the summer months be sure to have a martini at the Roof Garden Cafe. Finally, step outside for awhile and enjoy Central Park. You may leave and enter all day as long as you keep your receipt. I recommend a quick trip over to Eli Zabar's Eat where you can get classic New York bagels and a variety of shmears. Bring some napkins, a blanket and stretch out on the grass just beyond the Met's walls. And don't worry if you lose your receipt. The Met's admission policy is pay-what-you-wish so a donation in any amount is acceptable. Admission is a recommended donation. You must pay to enter the museum, but in any amount you wish. Friday and Saturday: 10:00 a.m.–9:00 p.m.
How to see treasures from Pompeii in Italy and the U.S.
Ready for Some Quirky Budget Hotels?